I love to observe the various looks on students’ faces when I pose the following question…How much time do you spend thinking about your thinking? Based on the nonverbal responses I get, the answer is a resounding “not much.” For many of them, it’s the first time they have even considered the concept of awareness with regard to their own thinking. After all, doesn’t it just happen? In case you haven’t noticed, we talk to ourselves ALL of the time. This is often referred to as our inner dialogue or little voice. 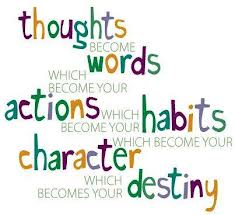 Regardless of what you choose to call it, the thoughts we generate (often by habit) greatly influence the feelings we experience and the choices we make. One way to imagine this never ending sea of thoughts is to think of it as a radio that never turns off. If this is the case, what station are you listening to right now? Below are a few of the most commonly played stations on your internal radio. Join host Negative Norm as he fills your mind with messages of hopelessness. You might recognize some of the songs that typically play on this station. Join host Positive Pete as he fills your mind with ALL that is possible. There are no limits on Pete’s station and his songs will prove it. Obviously, if we are tuned in to 99.9 or 100.5, we don’t particularly enjoy the content of the song (our thoughts). Unfortunately, the most common strategy we use when we’re aware that we are tuned in to either of these stations is to resist it or avoid it. The law of resistance says that the very thoughts we are trying to get rid of will persist. Below are a few strategies that will help you change the station. Remember, YOU control the dial. Instead of saying I can’t do this, replace those words with I’m having a thought that I can’t do this. Instead of accepting the thought as truth, which you know it isn’t, simply thank your mind for the thought and replace it with a more effective one. Don’t BUY it, just BE with it. Ask yourself the following question…Would I purchase this thought with money? If the answer is no (which I hope it is), then simply be with the thought and celebrate the fact that you didn’t buy it. Imagine that your negative thoughts are like those nasty “pop up” ads that appear on websites. When you see the ads, realize that the information they are sharing isn’t relevant to you and begin seeking information that is. Imagine that your negative thought was written on a name tag and you were asked to wear it. Would you put it on? If the answer is no, then choose a new name tag.